"Los Kissinger en su casa de Nueva York" is an article torn from a magazine The Devoted Classicist found while going through an unlabeled file recently. Although the article is unmarked, there is no mistaking that it is from Hola! magazine. It probably dates from the 90s, when I first discovered the popular periodical from Spain and used it for Show & Tell readings to cheer up a very ill friend. The magazine's format is simple, but tried-and-true, with at-home interviews accompanied by as many as a dozen snapshot-like portraits with a wide angle lens that also manages to get in plenty of the decor. 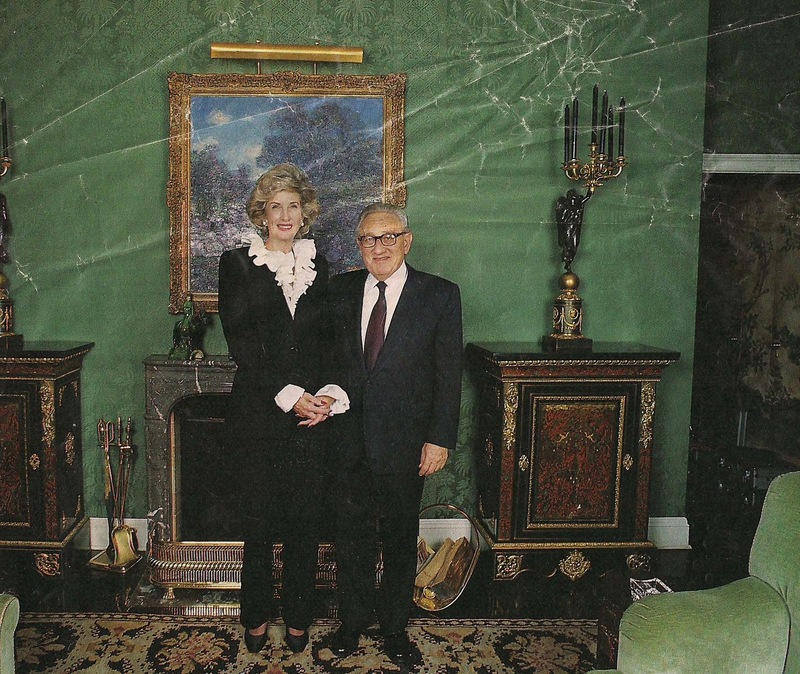 Nancy and Henry Kissinger (seated). 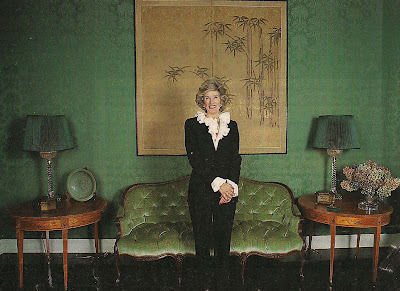 Nancy Kissinger is a member of the Board of Directors of the Queen Sofia Spanish Institute, located in a handsome, landmark, 1927 Federal Revival townhouse designed by McKim, Mead & White; it was donated by Margaret Rockefeller Strong de Larrain, Marquesa de Cuevas, in 1965. The article marks the ocassion of Mrs. Kissinger being that year's chairperson of the fund-raising gala that honors the Gold Medal award winners that have been recognized for their contributions to the betterment of relations between the United States and Spain. (Dr. Henry Kissinger was one of the honorees in 2005, and recently-in-the-news newlywed H.E. 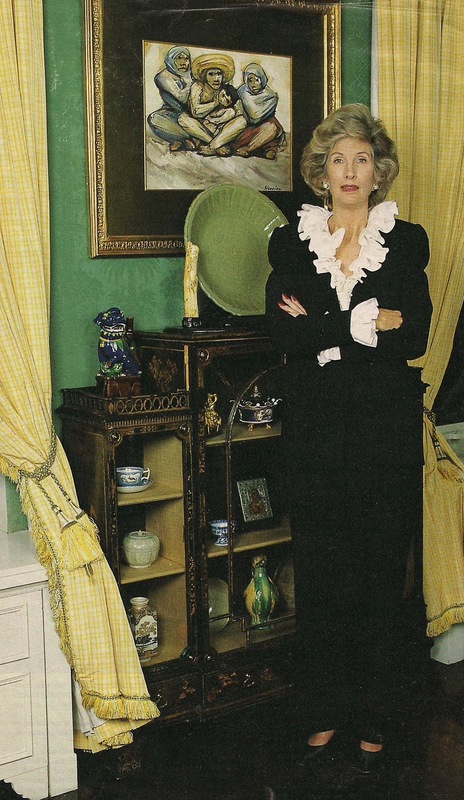 The Duchess of Alba in 2008). 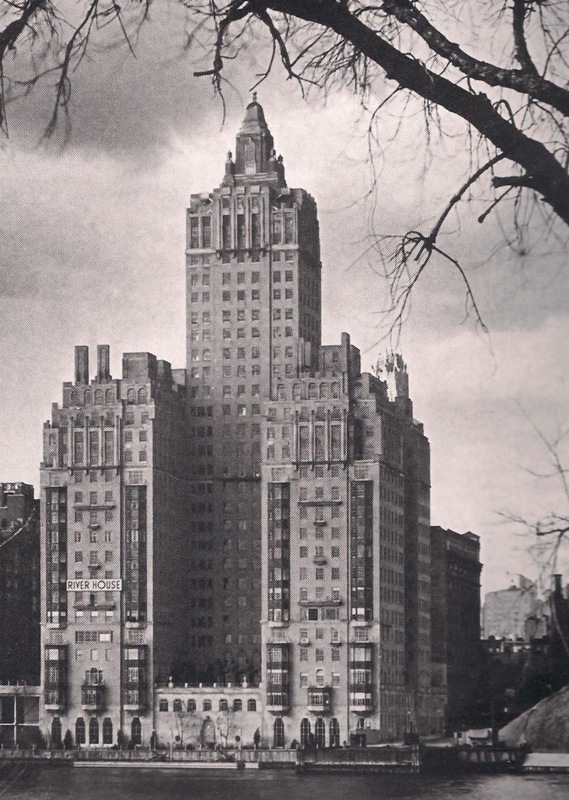 But before the photos of the Kissingers' apartment, some background on the famous building, River House. One of the most prestigious apartment buildings in Manhattan is the 26 story River House located at 435 East 52nd Street. And it is among the most exclusive buildings, with the co-operative By-Laws reportedly prohibiting the building's name or address in real estate sale listings. 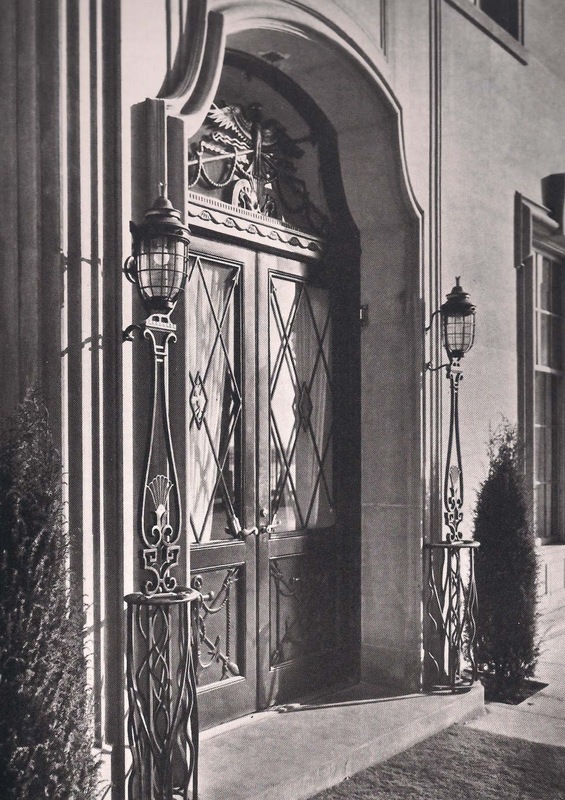 The courtyard entrance of River House. Located on the bank of the East River, its relatively secluded location (Greta Garbo lived across the street) on a dead-end street with entrance through a private courtyard allowing limousines to pull up to the door is a considerable selling point. 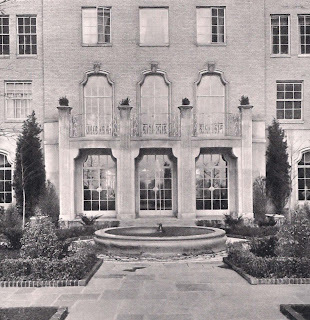 A vintage view of the Reception Hall of River House. Past the doorman and the Foyer is a long gallery Reception Hall that overlooks the Fountain Court (as seen in the first image) and the East River beyond. Mirrored panels of verre eglomise waterway scenes by Jan Juta, 1895-1990, are featured in the space decorated by Ernesta Beaux. (For more on these two talents, and a better look at one of these murals, see the Aestheticus Rex blog). Marble Art Deco versions of classical fluted pilasters flank the murals and give visual support to the cornice decorated by alternating moons and stars. The original scheme had creme cast plaster gulls on a pinkish-brown ceiling above the Beaux-designed rugs in tones of brown, lemon yellow, henna and gray to compliment Directoire Revival and Empire/Beidermeier Revival furnishings. 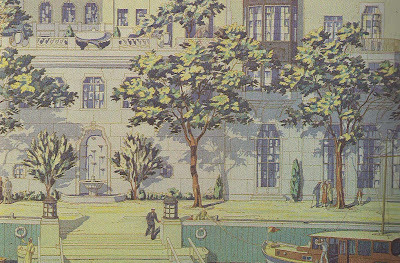 Watercolor renderings of the river landing from the original sales prospectus. A river landing was another original feature, but it lasted only until the FDR Drive was constructed in 1934. 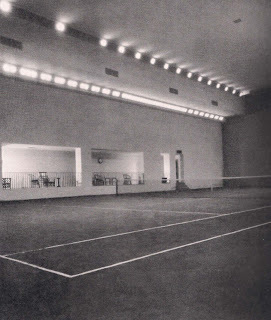 The River Club, limited to 400 men and women from New York and 200 from other states, is an original amenity that still exists with an indoor swimming pool, two indoor championship tennis courts, ballroom, oyster bar, dining room, and 26 suites for out-of-town members and guests. In addition to the separate 52nd Street entrance, there was previously an entrance from the river landing, and there is an elevator entrance from the River House lobby. The Lounge at the Indoor Swimming Pool of the River Club. A vintage view of an indoor tennis court at the River Club. 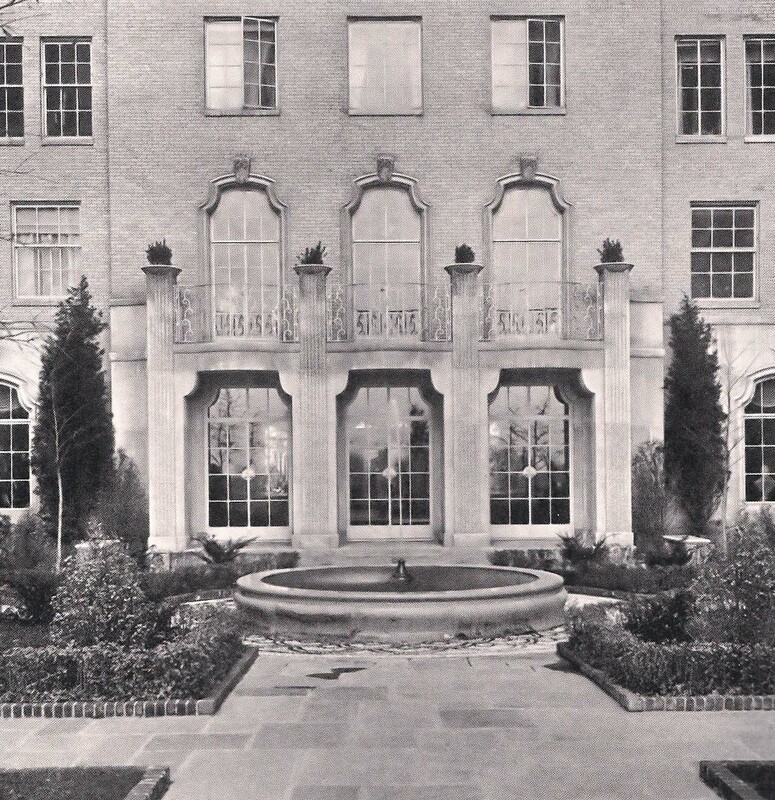 The entire building, including the River Club, was designed by William Lawrence Bottomley, the principal of the architectural firm Bottomley, Wagner, & White, and built 1929-32. River views, privacy, and natural ventilation were all carefully considered for each of the 64 simplex (one story), duplex (two story), and triplex (three story) apartments, varying from 8 to 17 rooms. 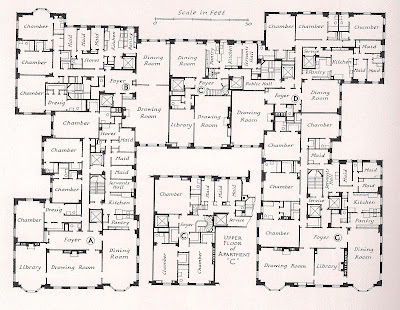 A typical floor plan of River House. 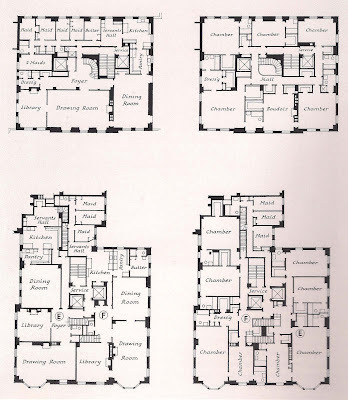 A very unusual feature is the interlocking plans of the "E" and "F" duplex apartments which have the public rooms of the apartment on the lower floor on one side of the wind and the private rooms on the opposite side above, allowing for variations in exposure. Also, the ceiling heights vary, higher in the entertaining levels and lower in the bedroom levels. 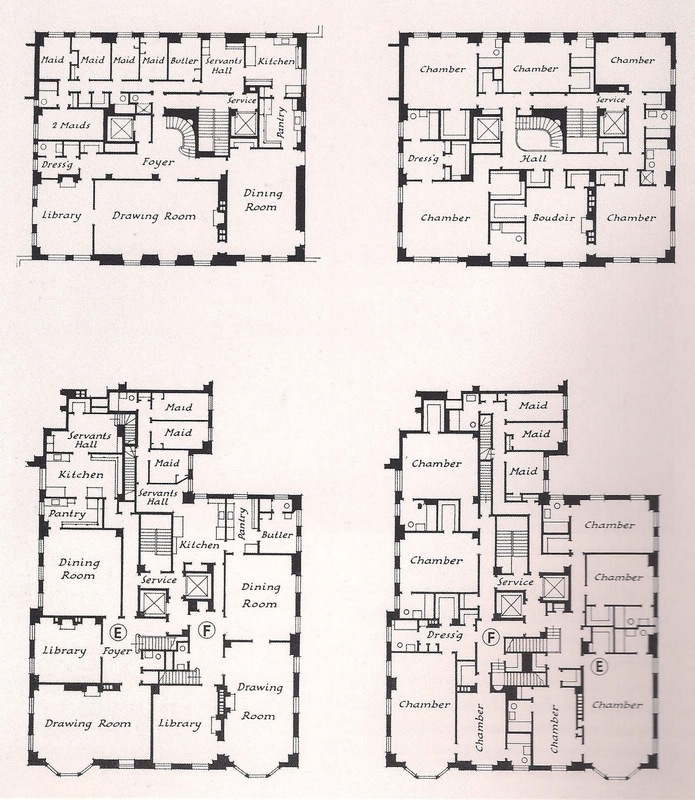 Floor Plans for the tower apartments and the "E" and "F" duplexes. Tower apartments with exposures on all four sides start on the 17th floor. 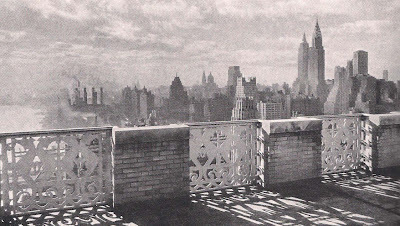 The top of the building was originally a triplex with private terraces, but it was later divided to two apartments, a duplex and a simplex above. (That duplex was famously owned by Susan and John Gutfreund in the 1980s, with a number of so-called "bad neighbor" incidents reported in the tabloids including the hoisting of a 22 foot Christmas tree up the outside of the building via a wrench mounted on their upstairs neighbor's terrace). View from a penthouse terrace at River House. Those living outside the big urban areas often find the concept of a co-operative building difficult to understand. In the briefest of terms, a purchase involves shares in ownership and the right to occupy a specific apartment. It also means that a potential buyer has to be approved by the Board, and rejection requires no explanation. In a well-publicized lawsuit, Gloria Vanderbilt sued, claiming that she was not even allowed an interview. Others who reportedly were turned away were Richard Nixon and Diane Keaton. 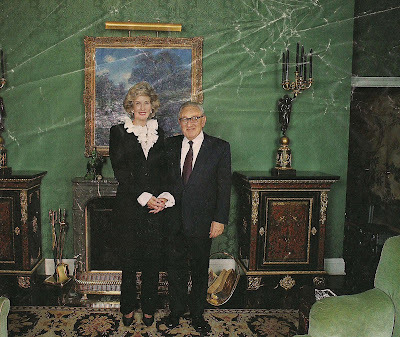 Henry Kissinger has lived in River House for decades and is always mentioned whenever there is a list of residents, so The Devoted Classicist is not compromising any confidences here. It is a guess that this is an "E" duplex by interpreting the photos, but it is only a guess, and nothing is known about the decorator. Considering the owners' wealth, education and exposure, the Living Room is remarkably unfinished. Perhaps when it is filled with people, the flaws are less noticeable. The scraggly potted orchids, and bunches of dried hydrangeas, inexpensive decoration, would indicate that at-home entertaining is infrequent. The presence of at least four crystal ashtrays might contradict that, however. 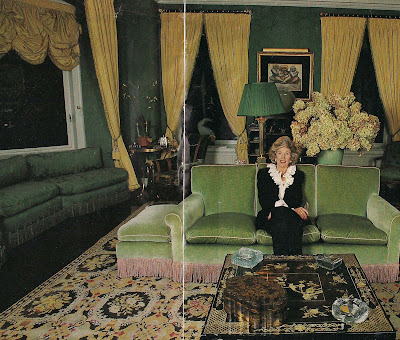 Despite the over-use of green, this writer would have considered window treatments that were the same color as the walls, letting the Bessarabian rug be the major colorful pattern, and added throw pillows. Also, the room would be improved if art could play a bigger role. The lacquered and inlaid pieces do add a richness, however. The original 6-over-6 double hung windows have been replaced with single pane tilt-turn sash that unfortunately give big expanses of darkness at night. This writer, influenced by former employer Sister Parish, favors black candles, too, but does not display them without first burning the wicks briefly. 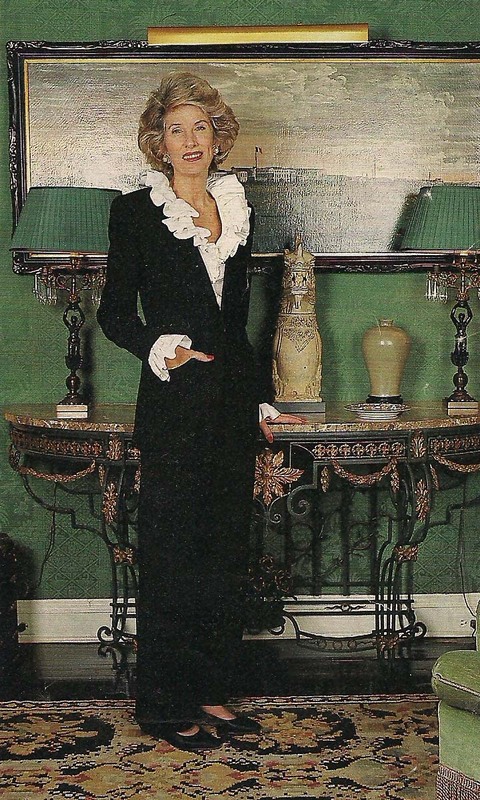 A manila clasp envelope on the left cabinet, presumed to be a late nineteenth century Boulle revival pair, appears in a previous shot. Although the two-panel screen mounted on the wall above the canape is not objectionable, a stronger piece of art would help distract from the "legginess" of the furniture. Just guessing, it looks like there is seating for at least 21 in this room, which is good; a Living Room should seat, at the very least, the same number as the Dining Room. Again, it is not that the furnishings themselves are objectionable; it is just an uncomfortable arrangement. 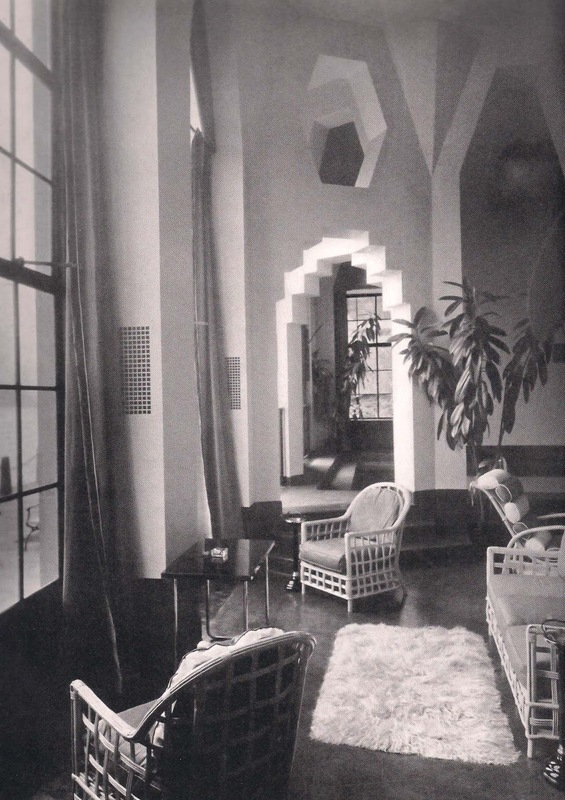 It is hoped that this rare, un-styled look into a celebrity interior was appreciated from a socio-anthropological and decorative point of view. Do the readers have any suggestions for the Kissingers for a little home improvement? 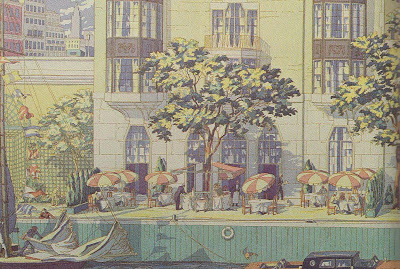 The color vintage photos of River House are from THE WORK OF WILLIAM LAWRENCE BOTTOMLEY IN RICHMOND by William B. O'Neal and Christopher Weeks, University Press of Virginia, and the black & white photos are from THE ARCHITECTURE OF WILLIAM LAWRENCE BOTTOMLEY by Susan Hume Frazer, Acanthus Press, available here. 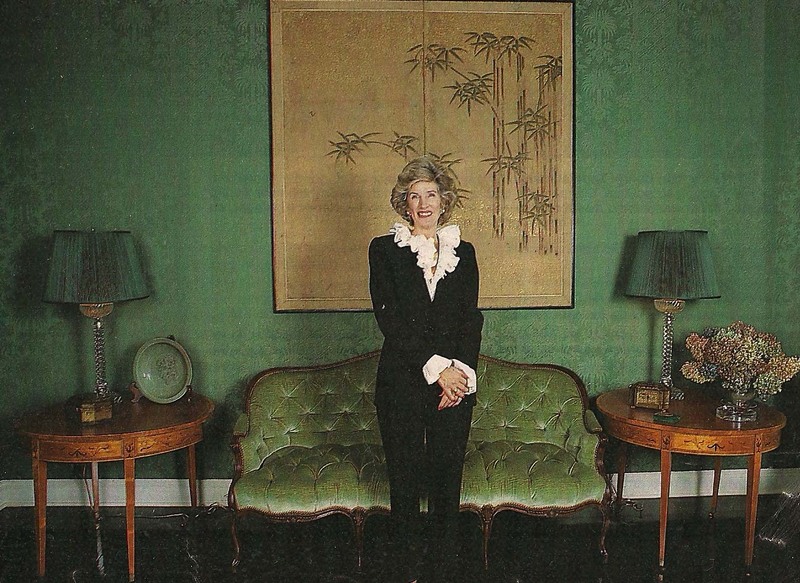 The photos of the Kissingers in their River House apartment are from HOLA! magazine, available here. out details and distort colour. I think you're right. If the art were stronger/ better it would make all the difference. Toby, your points are well taken. The off-center bay window is definitely a major issue to consider. That is why I was thinking that the contrasting curtains did not help. And I had forgotten that flash can wreck havoc with colorations not visible otherwise. As always, your comments are greatly appreciated. Scott, the watercolors are absolutely delightful aren't they? I am afraid I neglected to credit T.M. Cleland, a famous illustrator of the time. Thanks so much, a breathtaking amount of information is this one post. I'm going to study. 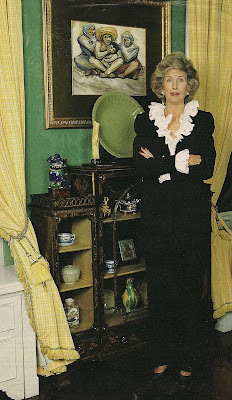 As far as the Decoration goes, Mrs. Kissinger was known to have worked extensively with Bob Denning and Vincent Fourade at her Connecticut house in the Mid-80's. It was published in either AD or HAG. I'm guessing that these rooms were done by them maybe 5 years earlier at the end of the 70's. The green on green and not so Fine French Furniture are indicative of their style and merciful on surfaces of heavy smokers. Terry, you will enjoy the plans and details of River House. D.E.D., thanks for your understanding about the clippings. I hated not to use the shot at the fireplace despite that it was crumpled. In the past, I have not been so big on clipping, but the ability to scan may change that avoid the loose paper. John C., now that you mention it, I can see Denning and Forcade as the decorators. Radiators and thru-the-wall a/c do not help filter cigarette smoke so I can imagine that the decor has really taken a beating. Many thanks for commenting. radiators to contend with! It doesn't seem right. 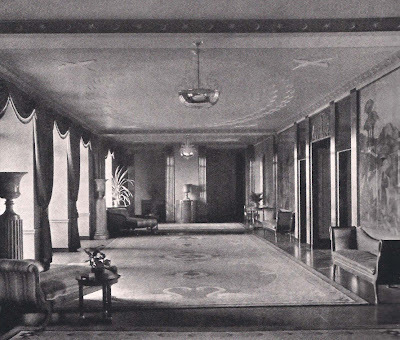 Toby, as you are aware, the exterior walls in the luxury pre-war buildings are thick enough so that the radiators do not generally project into the room so much to interfere with curtains. On occasion I have replaced one with a smaller but more efficient new model. But it is the thru-the-wall air conditioners that are such a problem because of that deep projection into the room; sometimes a "breakfront" plan helps, even if the panels do not draw. And solar shades also help. But the heating and cooling has to be taken into account when considering window treatments in Manhattan. 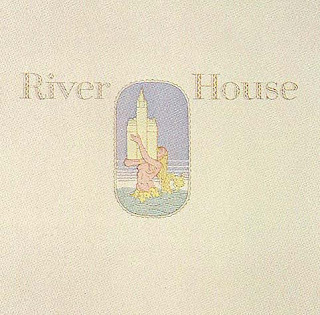 Fascinating to read about River House and the Ks; was Bill Blass's final apartment there? Surely, black candles, even if briefly lit, are wrong? To me, they are spooky and goulish, never mind what Sister said, they remind me of Alister Crowley. Candles must only be white! White candles are Not always right - ivory is preferable. Black candles are very chic and look especially right in an ormolu and patinated bronze candle holder. Sister Parish always got it right. Herts, thank you for commenting. 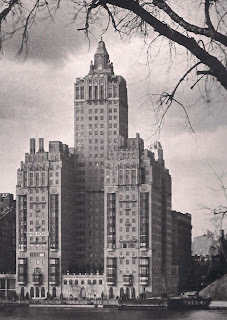 The Blass apartment was located at One Sutton Place South, the building featured in a recent post. In fact, it was in the same "A" line on the top full floor of the building (but not the penthouse). 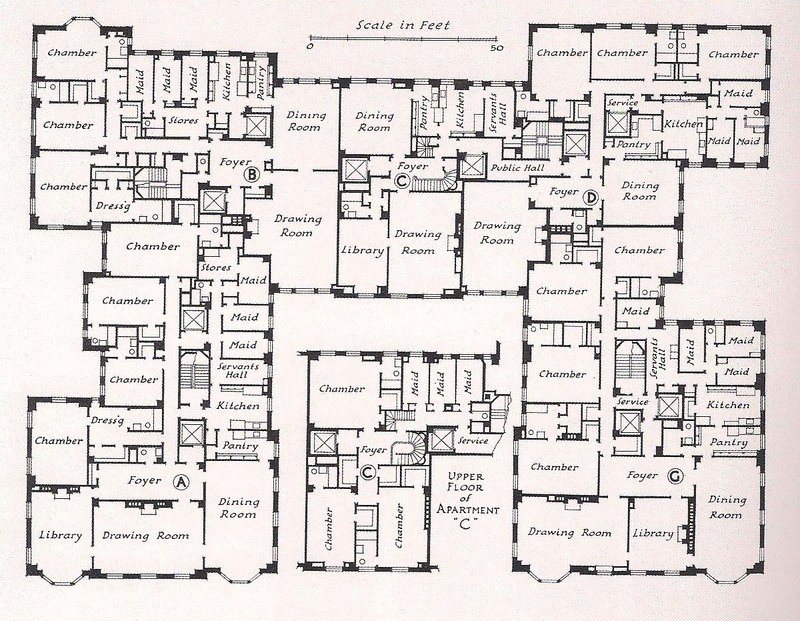 Some of the rooms of Mr Blass's apartment had been previously joined to the adjacent however. So he had the main rooms but not all the bedrooms. I was fortunate to have visited the Blass apartment and will feature it in a future post. As for Aleister Crawley, there are so many famous drug addicts these days, it is not a name I have heard in a long time. But I can assure you that most of those using black candles have no connection with the occult whatsoever! A black candle takes away the element of the glowing column found with pale candles and some prefer that strictly from a decorative point of view. But that is why candles are made in so many colors, so each can follow his own preference. Brings back so many memories! Growing up, we always stayed at the River Club when we were in the city. Playing tennis on those courts was an experience. And a breakfast of corned beef hash and eggs while looking out on the river was my favorite! Helen, I know that must have been wonderful. Thank you for sharing. Gentle Readers, please note that Anonymous comments cannot be published despite that option being given in the standard Blogger template. Please use the NAME option; if you fear retribution from the River House co-op Board and being forever blackballed, just type in something like "Patty 0'Furniture". The decoration/design of this space is simply very uninspiring. There doesn't appear to be any life or joy in this room. Great post!! Mary, the room seems to have gotten off to a good start but, for some reason, was not really finished. If Denning & Fourcade were involved, as one reader says, they would not have voluntarily left it as shown. It's a bit of a Decorating Mystery! Many thanks for commenting. Those rooms are terribly unwelcoming and those yellow curtains bother me to distraction. I am not a designer but I agree with you, they should be the same color as the walls. The room strikes me as similar to the ones you find at a private club in NYC. Good for receptions but very unwelcoming. I remember the Xmas tree story and the articles in the press. I also remember Gloria V getting turned down at some co-ops because of her friendship with Bobby Short. Boy, co-op gossip is a real trip! I stumbled upon this post whilst researching T. M. Cleland. I'm delighted by these illustrations! I've never seen these and I have a large collection. You say they are from an original sales prospectus; are you aware of other copies of that document? 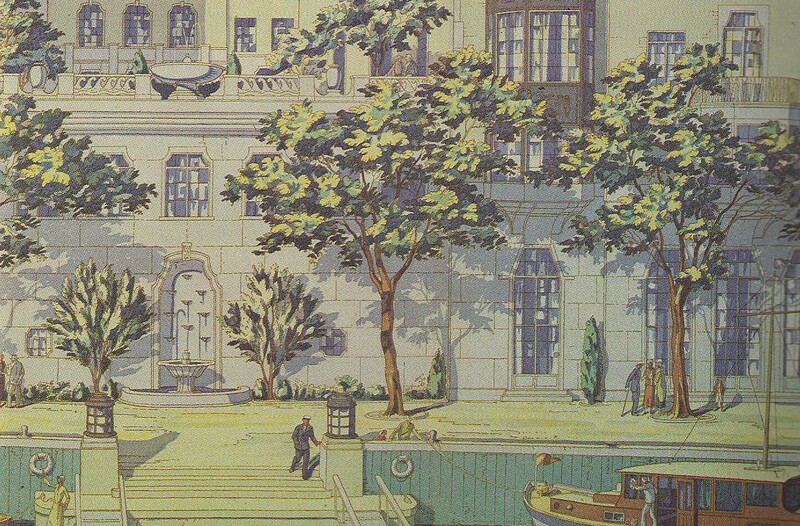 Do you have any other illustrations by Mr. Cleland? Thanks for the great read! Rachael, these are the only images by Cleland, the cover of the prospectus and the East River landing, that were reproduced in THE WORK OF WILLIAM LAWRENCE BOTTOMLEY IN RICHMOND. The text in describing the document says the landing plate was printed using the Jean Berte (sorry I cannot add the accent over the final "e") watercolor process. It can be difficult to give vitality to an architecturally correct rendering, but these are exceptional examples that do just that. Thanks for commenting. Lindaraxa: although I felt the Gloria Vanderbilt (now known by some only as the mother of Anderson Cooper) rejection had to do with her ties to the fashion industry (and the incessant ads for her jeans), notes from my readers reveal that they are convinced it did indeed have to do with her relationship with Bobby Short. You do these articles so well, delving into New York, a city of fascinating nooks and crannies. I'm amused by your own comments about how you might have fixed what they have there, but it's a period piece, isn't it? It's all about time and place and the tastes of both. Simply put, far too much green; while I'm certain the intention was to relay a sense of individual colour taste, and personality, it is simply overpowering in my opinion. Carful attention has been given to obtaining, quality, period pieces, unfortunately they are not done justice in this dark, monochromatic scheme. 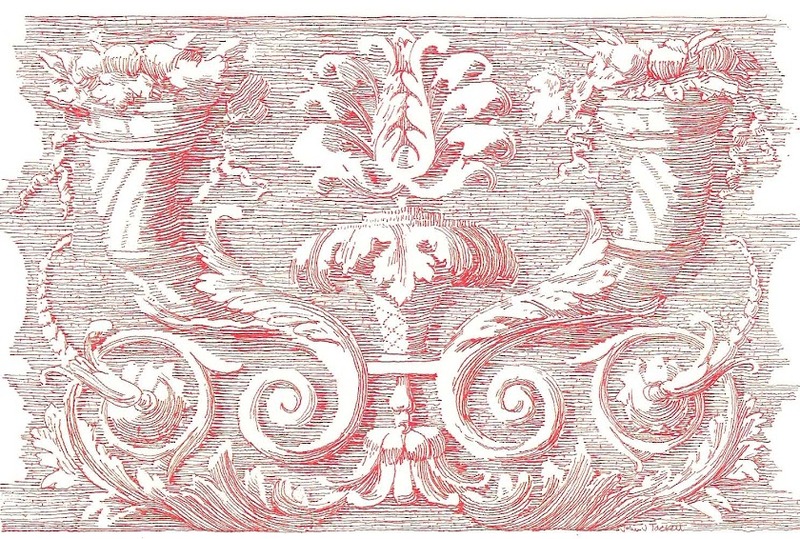 The fine details, and sense of luxury are almost lost, with little to ground the space, since the colour consumes all. There are a few comfortable, interesting elements, such as the large, velvet sofa, but the over all effect is far to heavy, with tension, rather than what could have been interesting juxtaposition. Two thoughts: 1) Interesting to compare HK's Green Room with The Green Room in the Whte House; and 2) Another classic example of too much money and too little taste.